These individual chocolate puddings are rich and delicious, and simple to make. 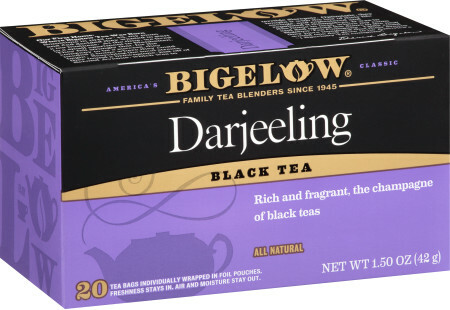 Bigelow Darjeeling Tea gives this dessert an elegant flair and distinct flavor. Try pouring into popsicle molds and freeze overnight for a decadent frozen treat! In a glass measuring cup, heat milk in the microwave for 1-2 minutes, or until very hot. Alternatively, this step can be done in a small saucepan over medium-high heat on the stovetop. Place the tea bags in the hot milk and allow to steep for 2 minutes. Thoroughly squeeze out tea bags into milk before discarding. Meanwhile, place chocolate chips in a blender and process until finely chopped. Pour the hot tea infused milk over the chocolate and blend until smooth, about one minute. Add egg and a pinch of salt and blend again to incorporate fully. Note: It is important that the milk is hot to ensure the chocolate melts completely and creates the right consistency. Divide mixture evenly between four tea cups (or individually sized ramekins) and place in refrigerator to chill for at least 30 minutes. During this time, the mixture will firm up to the consistency of pudding. Serve chilled, with any combination of the following garnishes: whipped cream, fresh raspberries, or fresh mint leaves. May we suggest Caramel Chai Tea - Case 6 boxes- total of 120 teabags to pair with this recipe?